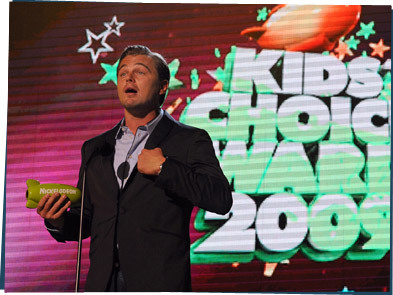 Did you know Leonardo DiCaprio won a very prestigious award recently? The Nickelodeon Big Green Help Award! Look, he even got a cool green blimp. Yep, that's because he does so many amazing things for the planet, like making cool movies about the environment, living as green as he can, and setting up awesome environmental foundations. He's so wonderful. I mean, his work. His work is so wonderful.